Sony VPL-VW95ES review | What Hi-Fi? 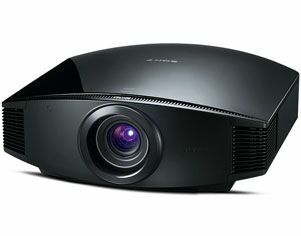 The VPL-VW95ES is Sony’s flagship 3D projector, its mission to build on the performance of its HW30ES sibling. If it can better that fine design, Sony ought to be on to another winner here, despite the heftier price. The HW95ES is based on Sony’s SXRD projection technology, designed to deliver optimum brightness and contrast without the sometimes-distracting presence of a colour wheel (as used in DLP projectors). As you’d expect, the extra cash brings notably more power, with the VW95ES claiming a dynamic contrast ratio of 150:000:1 (more than twice that of the cheaper projector). You also get a natty motorized lens shutter and lens assembly for zoom, shift and focus, and all the 3D kit you need – including two pairs of glasses. of your active-shutter glasses, ensuring the 3D picture doesn’t suffer from the overly dark feel that can afflict some projectors. Yet despite all this 3D-orientated tech, it’s the Sony’s 2D picture that most impressed us. It’s exceptionally crisp, looking great with HD broadcasts of England’s recent football matches and plain brilliant with a 1080p Blu-ray of Boardwalk Empire. Black depth and white-level output are excellent, colours appear rich but satisfyingly natural and motion is good. The Motionflow system adds useful smoothness to the fast panning in football coverage, but we’d keep this mode on a low setting (or turn if off altogether) with Blu-ray – otherwise movement can look artificially slick. – the sense of depth is considerable and sharpness is hard to fault. However, some motion still seems unnatural and, even with the best discs, such as Despicable Me, there’s still a trace of crosstalk. But that’s not enough to detract from our high opinion. We’ve almost nothing to criticize in its 2D offering, and it’s a delight to install and live with, not least because it’s quiet. Add good 3D performance, and you’ve clearly got a very talented performer.